This badge was issued to JOAO OLIVEIRA on 15 Jul 2017. This badge holder has a understanding of the essentials of IBM Cloud. 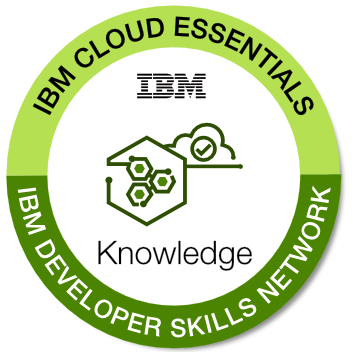 Through an online course they have learned about the IBM Cloud platform and gained hands-on experience using the Cloud Foundry command-line interface and the IBM Eclipse tools for IBM Cloud. The badge earner has used these tools to deploy and modify basic applications using a managed service in IBM Cloud. Completion of the course "IBM Cloud Essentials" including passing in-course assessments with a score of 80% or higher. Note: This badge was originally named Bluemix Essentials and has been renamed to reflect IBM's re-branding to IBM Cloud.